The Will Durant Timeline Project is a historical research project to document the career of philosopher and historian Will Durant. The project is primarily concerned with the lecture career of Durant, which spanned four decades, and with examining the themes that emerge from the data. The goal of the site is to educate the public about the life, career, and ideas of Will Durant. Included on this site is a timeline of known Durant lectures and public appearances, from his early career to his last years. Also included are historical documents, such as photographs, newspaper articles, and correspondence. The site's primary author and researcher is Dr. James Bishop, executive director of The Passionate Mind Institute. Dr. Bishop is the co-producer and editor of the documentary A Visit with Will and Ariel Durant, the editor of the annotated edition of Durant's Philosophy and the Social Problem, and a principal member of the now-inactive Will Durant Foundation. The Will Durant Timeline Project is provided through the support of The Passionate Mind Institute, a non-profit 501c3 charitable institution dedicated to research, support, and advocacy for gifted and talented individuals pursuing their passions. If you would like to make a tax-deductible donation to support the work of this project, you can do so here. The Will Durant Timeline Project is an independent research project not affiliated with the Will Durant Foundation or the estate of Will Durant. Pulitzer Prize winner and Presidential Medal of Freedom recipient Will Durant gave over a thousand lectures during the 20th century. The following is an excerpt from a recording of his speech "The Roosevelt Revolution" given at Carnegie Hall in Manhattan on December 10, 1933. 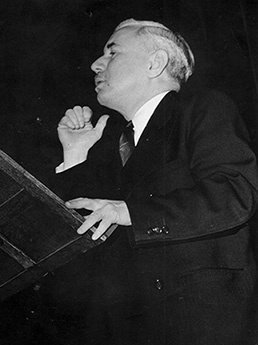 The audio recording of this entire speech was recently discovered on a series of aluminum discs by the Will Durant Timeline Project, which had the recordings transferred to digital and restored for the Timeline Project archives. This speech has not been heard since the time of its original presentation. 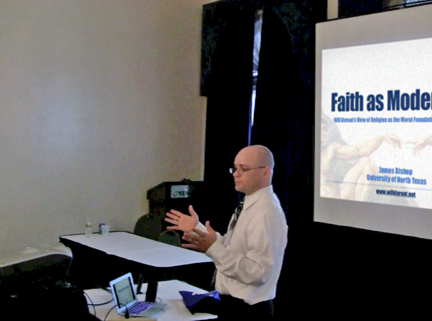 The Association for Moral Education hosted a presentation on Will Durant at its annual conference on November 8, 2012. The conference, held this year at the Menger Hotel in San Antonio, Texas, brings together moral theorists from all over the world and in a variety of disciplines, including educators, psychologists, philosophers, and researchers. The presentation, titled Faith as Moderator: Will Durant's Views on Religion as the Moral Foundation of Civilization, was heavily attended. At the conclusion of the presentation, presenter James Bishop, of the University of North Texas (and the host of the Will Durant Timeline Project), answered questions from the audience on the presentation topic as well as general questions about Will Durant. UPDATE: A number of people have inquired about the video of the presentation, which I have decided to release (see below). The sound quality is not the best, as it was recorded via camcorder from across the room. But we did a little clean up on the audio that improved it enough to make sharing the video viable.